Arhuaco First Nation protest in Valledupar, Colombia. Photo by Eduard Cujia, Twitter. 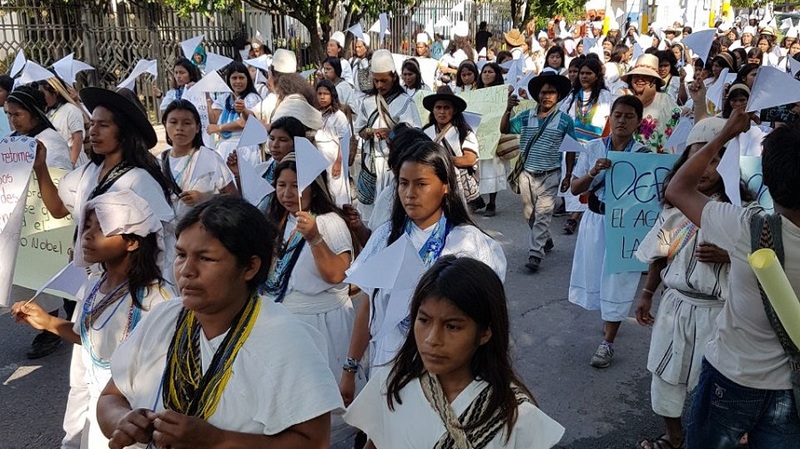 Hundreds of Colombian First Nations marched today in Valledupar, capital of the northern Cesar department, to demand government action against mining development on the Sierra Nevada de Santa Marta, the highest mountain/coastal system in the world. Talking to the local media, the leader of the Arhuaco tribe, Saúl Mindiola, said that mining operations in the area threaten both the natural environment and the physical and cultural survival of Indigenous communities. He said he is also worried about potential pollution of water resources that supply ancestral lands and nearby cities. According to Mindiola, the Juan Manuel Santos administration has granted about 200 mining titles and is assessing over 300 applications, including some for megaprojects, to exploit Sierra Nevada's mineral resources. He says that not only his people but also other Colombian tribes, university collectives and unions oppose such permitting spree. “We don’t sell our motherland and we think that when it comes to megaprojects, there is no consultation required because they shouldn’t be approved. Mining should be banned on the Sierra Nevada,” he told EFE (in Spanish). The goal of today’s protest was to reach Valledupar's town hall. Once there, the Arhuacos presented a series of demands centrered on forbidding any kind of mining in their territories, implementing protection and development programs for local First Nations, and guaranteeing that authorities and private companies adhere to existing laws and decrees regarding Aboriginal rights and environmental defence.